Fuser, Drum & Maintenance Kit - J.P. Patti, Inc. The fuser assembly is located at the back of your printer. After toner has been deposited on the paper, the fuser (which gets very hot) melts the toner so that it adheres permanently to the paper. If the fuser is not cleaned properly and regularly, it could need to be replaced as early as 35,000 prints. Dirt and debris can damage the fuser by scoring its surface. If you notice a ring around the roller, it may be time to replace the mechanism. If words and images come off the paper when a hand is run across them, there are a few possible problems. First, the fuser assembly may be damaged or at the end of its life. The solution is to replace the fuser assembly, usually referred to as a “Drum and/or Maintenance Kit”. Second, the toner cartridge may be defective and letting too much toner out at one time. 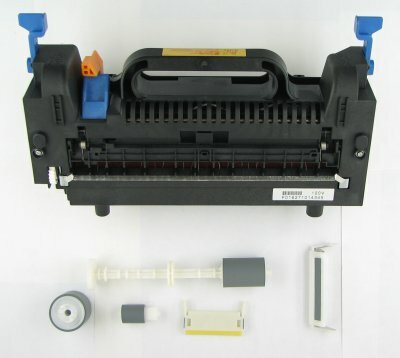 In a black-and-white laser printer, the solution is to replace the toner cartridge. In a color laser printer, only replace the cartridge that is exhibiting the problem. Third, some toner may have spilled in the printer. If so, you’ll need to clean it out.